Metro Manila, the capital region of the Philippines, is not just an urban economic center. With lots of hotels to choose from, many vacationists consider Metro Manila also as a less stressful alternative for a luxurious getaway. Treat yourself to an R&R without actually going interisland or abroad on a wide array of five-star hotels in Metro Manila. #1 - Okada Manila: One of the newest hotels in Metro Manila, this 44-hectare property already proves to be the most iconic integrated resort in the Philippines. It features one-of-a-kind entertainment, water fountain show, diverse dining options, waterfront views of the Manila Bay, and of course, world-class suites. #2 - Makati Shangri-la Hotel: A sure entry to every list of best five-star hotels in Metro Manila, this hotel has all that is expected from a premier five-star hotel, such as business center facilities, spa, breathtaking view of the Makati skyline, sumptuous buffets and even babysitting services. It is also just walking distance from the popular shopping malls and is 20 minutes away from the airport. #3 - Conrad Manila: Also a newly established hotel in the metro, this hotel has the most modern luxurious features in each room. Moreover, the hotel is not just elegant because of its sophisticated ship-like structure but also because of the first-class services, amenities and dining options that they offer. #4 - The Peninsula Manila: For over four decades, The Pen has always been associated with luxury, sophistication, and comfort. Aside from the elegant accommodations, quality service, and fine cuisine, they also offer a unique luxurious shuttle service to the airport and the mall area with its fleet of Mercedes sedans and Jeepneys. #5 - Diamond Hotel: Just like what its name conveys, Diamond Hotel is rich with elegant guest rooms, delicious food offerings, and professionally-trained staff. Conveniently located along Roxas Boulevard and near the city's business and commercial establishments, it is also perfect for both business and leisure travelers. #6 - Raffles Makati: Located in the heart of cosmopolitan Makati, this hotel serves as an oasis with 32 stylishly designed rooms, open-air swimming pools, relaxing spa, and different dining options. Expect to be treated like business executives as butlers are designated in every floor, always ready to assist with every guest's needs. #7 - Manila Marriot Hotel: Indulge in contemporary elegance, exceptional service, and strategic location in this deluxe hotel. 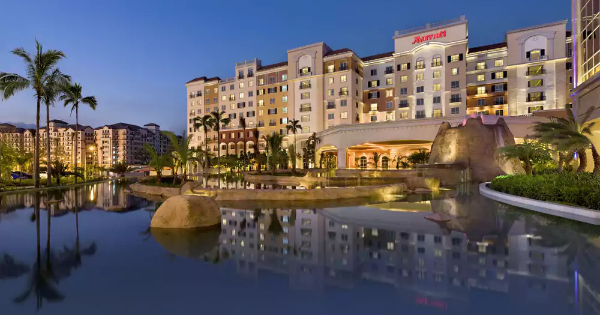 It is located adjacent a golf course, near the Manila International Airport, and within Resorts World Manila. It also offers deluxe accommodations, diverse dining options, pampering spa services, and fitness amenities. #8 - New World Manila Bay Hotel: Set against the famed Manila Bay sunset, this upscale hotel exudes comfort, convenience, and efficiency. With cozy accommodations, a variety of delicious international cuisine, state-of-the-art amenities, unparalleled location, and the most hospitable staff, you would definitely want to return. #9 - Sofitel Philippine Plaza Manila: Experience a unique perfect blend of local culture and French art innovation in this resort hotel that is designed by two national artists. Along with the lagoon-style pool, relaxing spa, and sumptuous buffets, you will surely never forget the spectacular view of the sunset from the private balcony of each room. #10 - Crown Towers Manila: Considered as the best out of the three hotels in City of Dreams, the newest luxury and entertainment complex in Manila, Crown Towers is not only known because of the casinos around the area. It also boasts of plush rooms with a poolside view, premium restaurants, lounges, and clubs, and a very convenient location.